Sheffield Wednesday and Championship leaders Leeds United both scored spectacular goals to share the points in an entertaining Yorkshire derby at Hillsborough. Adam Reach gave the Owls the lead in outrageous fashion with an incredible dipping volley from long range. After the break, Leeds levelled when Mateusz Klich found the net with an impressive strike from distance. The visitors almost snatched a late winner when Samu Saiz almost latched on to Jack Harrison's intelligent cross. The result means Leeds remain top, but they are just a point ahead of second-placed Middlesbrough, who face Hull City on Saturday. Wednesday moved up to ninth following the draw and their unbeaten run at Hillsborough is extended to seven games. In a frantic opening 30 minutes, Leeds almost broke the deadlock when Barry Douglas headed wide before Kalvin Phillips' miscued shot was blocked. However, Leeds ensured they remain the only side in the league to be unbeaten away from home this season following Klich's stunning equaliser. Leeds head coach Bielsa said: "I am truly disappointed. I don't like to judge the performance of the opponents, but the fact that we needed 25 chances to score talks about what we deserved. "Usually, we need three chances to score one goal and this statistic is common to teams that lead their competition. Against Birmingham in the previous game, we needed eight chances to score and tonight we needed 25. "I'm glad that the fans celebrated Klich's goal because he deserves the celebration from the fans. "When you evaluate the performance of the team and you look at the number of chances, you can't say that we're satisfied with the result. 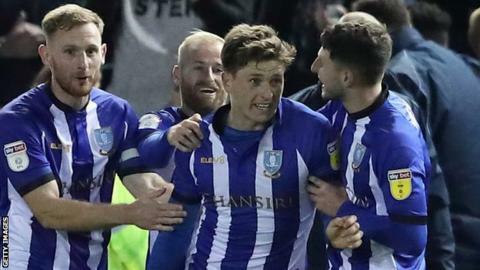 Sheffield Wednesday manager Jos Luhukay said: "This goal [Reach's] can be the best goal of the season. It was special. "It was a fantastic first half from both sides, played at an unbelievable speed. It was hard in the second half. Leeds made unbelievable pressure and they deserved to make the draw. They had chances to score a second goal. "It was for us the maximum result. Leeds deserved absolutely this point. The team had a mentality to get a better result but Leeds played with high pressure. "Leeds have a very good team, quick and offensive." Match ends, Sheffield Wednesday 1, Leeds United 1. Second Half ends, Sheffield Wednesday 1, Leeds United 1. Attempt missed. Liam Cooper (Leeds United) header from the centre of the box is too high. Assisted by Ezgjan Alioski with a cross following a corner. Corner, Leeds United. Conceded by Tom Lees. Attempt blocked. Jack Harrison (Leeds United) left footed shot from outside the box is blocked. Assisted by Mateusz Klich. Attempt saved. Adam Reach (Sheffield Wednesday) left footed shot from outside the box is saved in the bottom right corner. Attempt missed. Adam Forshaw (Leeds United) right footed shot from outside the box is high and wide to the right. Assisted by Luke Ayling. Substitution, Leeds United. Adam Forshaw replaces Samuel Sáiz. Attempt missed. Lucas João (Sheffield Wednesday) right footed shot from outside the box misses to the left. Offside, Sheffield Wednesday. Cameron Dawson tries a through ball, but Atdhe Nuhiu is caught offside. Offside, Leeds United. Jack Harrison tries a through ball, but Ezgjan Alioski is caught offside. Attempt missed. Jack Harrison (Leeds United) left footed shot from the right side of the box misses to the left. Assisted by Tyler Roberts following a fast break. Offside, Leeds United. Samuel Sáiz tries a through ball, but Tyler Roberts is caught offside. Corner, Leeds United. Conceded by Jordan Thorniley. Attempt blocked. Tyler Roberts (Leeds United) header from very close range is blocked. Assisted by Luke Ayling. Attempt missed. Luke Ayling (Leeds United) left footed shot from the centre of the box misses to the right following a corner. Attempt saved. Ezgjan Alioski (Leeds United) left footed shot from outside the box is saved in the centre of the goal. Assisted by Samuel Sáiz. Attempt blocked. Ezgjan Alioski (Leeds United) right footed shot from the centre of the box is blocked. Assisted by Jack Harrison. Attempt saved. Luke Ayling (Leeds United) left footed shot from the right side of the box is saved in the centre of the goal. Assisted by Liam Cooper. Attempt blocked. Liam Cooper (Leeds United) header from the centre of the box is blocked. Assisted by Ezgjan Alioski with a cross.